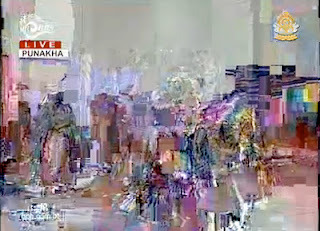 green tea: Bhutan Royal Wedding! [Also, the AP version, BBC version and an Indian TV version]. The day after the wedding, the King and Queen walked almost the whole distance from Punakha (the old capital) to Thimphu (the current capital). The roadside was lined with well wishers who were yearning for a glimpse of the bride and groom. It took the royal party 14 hours to travel the 71 km. Apparently, the King did not want to miss anyone. Keep in mind this is a mountain road, not a flat one. Thank goodness they are both sporty! 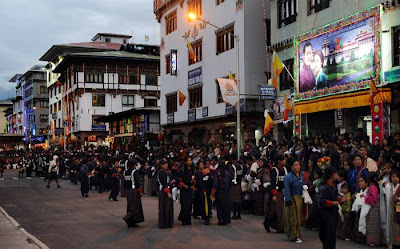 Here's the scene in Thimphu as crowds wait for the couple to arrive on foot. The celebration continued today with an enormous public event at Changlimithang Stadium [I previously wrote about the stadium here]. Check back later because I'll be posting about the CLOTHES. Love those traditional clothes! I cannot believe they walked that whole distance! That's so lovely! Can't wait for the clothes post. They're such gorgeous people! Great Pair! They are looking really awesome in these outfits..